Home Physiology of Endurance Performance VO2max / What is the VO2max? VO2max / What is the VO2max? The VO2max or maximal oxygen uptake is a key physiological measure of cardiovascular fitness and can help to explain differences in sporting performance between individuals. It tells us the maximum amount of oxygen that our bodies are able to consume when exercising. The VO2max is influenced by a number of factors including: 1) The ability of the lungs to absorb large amounts of oxygen; 2) the ability of our heart and blood system (blood, blood vessels – arteries, veins, capillaries) to efficiently transport the oxygen around the body to the working muscles; 3) the ability of the working muscles to consume large amounts of oxygen which is dependent on factors like the proportion of slow twitch muscle fibres, the amount of mitochondria, aerobic enzymes and capillaries. The VO2max is measured in millilitres of oxygen consumed per kilogram of body weight per minute. Scientists express VO2max relative to bodyweight which gives a more useful measure of oxygen consumption since it tells us how much oxygen is consumed per kilogram of body mass. This is important since two athletes may be able to absorb the same total amount of oxygen (e.g. 4 litres per minute) but if one of the athlete is lighter then there will be a greater distribution of oxygen per kilogram of body mass e.g. a 70kg athlete consuming 4 litres of oxygen per minute would have a VO2max of ~57ml/kg/min whereas an 80kg athlete consuming the same amount would have a lower VO2max of 50ml/kg/min. As such changes in bodyweight can significantly affect VO2max values – a reduction in bodyweight (e.g. reduced body fat) would normally result in an increased VO2max whereas increased bodyweight (whether that be increased body fat or muscle) would normally result in a reduced VO2max. This is one of the reasons why most successful endurance athletes tend to have fairly low body weights. Most elite athletes undergo VO2max testing in order to monitor fitness levels and for determining VO2max training zones. This would normally be done using an incremental exercise test in which speed or power is increased in incremental stages until either oxygen consumption plateaus or the athlete fails to complete a work stage. There are also a number of field based tests that can be used as an estimate of VO2max – these are discussed later in this article. Although the measurement of VO2max can be useful for athletes it is primarily a measure of cardiovascular fitness. Many coaches and sports scientists view the measurement of the lactate threshold to be of greater importance for both training prescription and assessment of race fitness. VO2max values can vary greatly between individuals with untrained individuals typically have a VO2max in the range of 25-45ml/kg/min. Following a period of intensive aerobic training this can increase significantly by approximately 10-25% (Gormley et al., 2008; Green et al., 1995; Smith and O’Donnell, 1984; Pollock 1973;). However, the level of increase can vary greatly between individuals with some individuals showing little increase and some showing much larger increases. This variation in response is believed to be primarily due to genetic factors in which some individuals gain greater benefit from aerobic training than others. Elite endurance athletes typically record much higher VO2max values than those recorded for untrained or even trained individuals. Typically elite endurance athletes may have a VO2max in the region of 60-85ml/kg/min – 60-75ml/kg/min in women and 70-85ml/kg/min in men – with some athletes recording values of greater than 90ml/kg/min. Most of the improvements in VO2max appear to occur fairly early on in training and in the case of well trained endurance athletes there appears to be little subsequent increases in VO2max following increased training intensity or volume. Research in cross country skiers found that there was no significant change in VO2max across a training season even though there were significant changes in both volume and intensity across the season (Losnegard et al., 2012). In fact improvements in performance of well-trained endurance athletes tend to be more associated with an increased ability to race at higher percentages of VO2max, improved lactate threshold profile and exercise economy (Jones, 2006). In this case study the current women’s Marathon record holder significantly improved her race performance despite her VO2max remaining fairly constant (~70ml/kg/min) between 1992 and 2003. Interestingly her VO2max remained fairly constant despite her training volume increasing from approximately 25-30miles/week to 120-160 miles/week over the course of the case study. A high VO2max is important since it means there will be a greater absorption and utilisation of oxygen in the working muscles, thus giving the athlete the potential to work at higher work rates before the muscles demand for oxygen exceeds the supply. It is considered to be one of the best indicators of cardiovascular fitness and has been shown to be a key determinant of endurance exercise performance (Conley and Krahenbuhl, 1980; Morgan et al., 1989; Jacobs et al., 2011). Interestingly, a high VO2max may be more important for older athletes, where research suggests that it may be a better predictor of endurance performance capacity than the lactate threshold (Marcell et al., 2003; Wiswell et al., 2000). The importance of a high VO2max has been questioned by some researchers and coaches however most elite endurance athletes tend to record a high VO2max (Noakes, 1991; Daniels and Daniels, 1992). Despite this it is important to note that there are a number of other factors that affect endurance exercise performance – exercise economy/economy of motion, sustainable %VO2max, Lactate threshold and the velocity at VO2max (vVO2max) – and as such an athlete with a higher VO2max will not necessarily beat an athlete with a lower VO2max. In essence a high VO2max gives an athlete the potential to reach an elite level, but there performance will also be dependent on other factors (Conley and Krahenbuhl, 1980; Morgan et al., 1989; Fallowfield and Wilkinson, 1999). A further consideration is that a high VO2max indicates that an athlete has an extremely efficient cardiovascular system that will not only allow them to maximize their potential, but likely allow them to better cope and recover more quickly from the physiological demands of the large training volumes and intensities utilised during endurance training. This is supported by research looking at the effects of interval training on excess post-exercise consumption (EPOC) in which the researchers found that those with greater cardiovascular fitness (i.e. higher VO2max) had a reduced magnitude of EPOC (Matsuo et al., 2012) – in other words they had a quicker return to resting metabolism than those with lower VO2max. There are a number of factors that affect an individuals VO2max including: age, gender, genetics/physiology, altitude, bodytype/bodycomposition, training status, exercise type. Age – Our VO2max is at it highest between the ages of 20-25. As we age our VO2max is known to decrease with age at a rate of approximately 0.5ml/kg/min per year. The decrease is due in part to the age related decline in maximum heart rate and stroke volume. Gender – Men generally have a slightly higher VO2max (approximately 15-30% higher) than women. The difference in VO2max between men and women is influenced by a number of factors including differences in %body fat, muscle mass, blood volume, and haemoglobin levels. Genetics/physiology – genetics/physiology plays a significant role in VO2max with approximately 10-30% of the variability in VO2max being attributed to genetics. Genetics appears to influence VO2max through a number of factors including: cardiac output – known to significantly influence VO2max (Poole and Richardson, 1997) , muscle fibre composition, body size, muscle mass, body fat %, mitochondrial density, aerobic enzyme levels, capillary density, lung capacity, viscosity of the blood and concentration of red blood cells. Altitude – the decreased air pressure at altitude reduces the availability of oxygen which in turn decreases VO2max. The extent of the decrease in VO2max increases with increasing altitude. In addition there can be wide individual variation in the effect of altitude on VO2max with larger decreases typically being observed in athletes with a higher VO2max’s recorded at sea level. Bodytype/body composition – since vo2max is expressed relative to bodyweight any variation in bodyweight will affect VO2max. Athlete’s with a large bodymass (even if its lean bodymass) tend to have lower VO2max than smaller athletes. Body composition is also known to influence VO2max – an athlete with a higher % bodyfat will tend to have a lower VO2max than a similarly sized athlete with a lower % bodyfat. Training status – training can significantly influence VO2max. The extent of the increase varies greatly between individuals but can be increased by up to 20% depending on current fitness, previous training history and your existing training regime. Highly trained elite athletes are unlikely to see further significant improvements in VO2max and any further improvements in exercise performance will likely come from improved lactate threshold, % sustainable VO2max and improved exercise economy. Exercise Type – the type of exercise is known to affect VO2max with greater values generally recorded in weight-baring exercises (e.g. running) than non-weight-baring exercises (e.g. swimming). If a levelling off is not observed then VO2max is considered to have occurred if two or more of the above criteria occur. 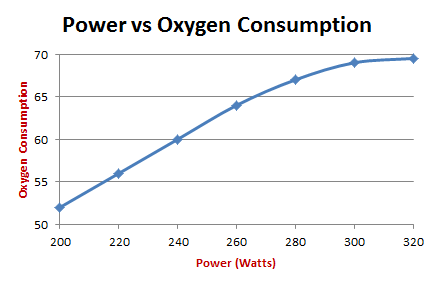 The two graphs (right) demonstrate the plateauing of oxygen consumption with increasing speed or power output. 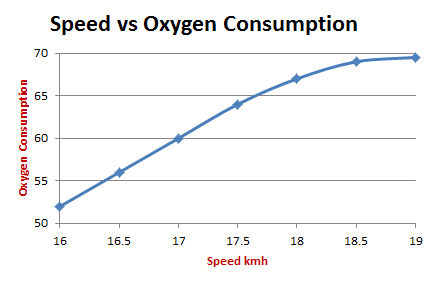 In these examples oxygen consumption increases linearly until at a given speed (running) or power output (cycling) it begins to plateau and VO2max occurs at around 18.5kmh during running and 300watts when cycling. The Cooper test is not accurate for everyone especially those with particularly good economy of motion. It is also far less accurate for those who participate in other sports such as swimming or cycling. Ratio between HRmax and HRrest (Uth et al., 2004) – in this method you divide your maximum heart rate by your resting heart rate and multiply this by 15 to get an estimate of VO2max. For me this tended to overestimate my VO2max predicting it to be 87ml/kg/min ([197/34]*15 = 86.9) however it is more applicable across multiple sports than the cooper test. Balke test – originally proposed by Bruno Balke (Balke, B. 1963) and involved running on a track for 15mins. VO2max is then calculated by the following VO2max = 6.5 + 5*Laps completed. This formula was then modified by Frank Horwill (Horwill F, 1991) so VO2max = (0.172*(distance in metres/15 – 133)) +33.3. This method tended to underestimate my VO2max predicting a value of around 68 (difference of 16.1%). This particular test appears to be better suited for people with good running economy (reduced oxygen consumption at given speeds) making it less likely to be accurate across other sports. Adequate Training volume – VO2max increases in response to increased training volume, however, training more than 6-7hours of aerobic training per week is not believed to result in further increases in VO2max but can lead to improvements in exercise economy and the sustainable %VO2max. It is important that an adequate amount of the training is performed at low/moderate intensity (approximately 50% of total training volume) and should be performed at approximately 70-80%HRmax. Interval training – training at between 90 and 100% VO2max – often referred to as high intensity interval training – is believed to be one of the best training methods for placing the greatest physiological stress on aerobic energy systems. This type of training involves performing repeated intervals (e.g. 5*3minute intervals with 60-90seconds recovery) at speeds or intensities that correspond with 90-100% VO2max. Altitude training/simulated altitude – altitude training has been popular amongst elite endurance athletes looking to enhance performance at sea level mainly due to the increased stimulation of red blood cell production following exposure to altitude. However, the benefits of living and training at altitude are controversial mainly due to the decrease training intensity at altitude. Research suggests that a better approach is to either, live at altitude whilst training at sea-level, or, to utilise simulated altitude tents (Levine and Stray-Gundersen, 1997;Bonetti and Hopkins 2009) although it should be noted that there appears to be a minimum exposure of 12h/day required for stimulation of erythropoiesis (red blood cell production) at altitude (Millet et al., 2010). VO2max is the maximum amount of oxygen that can be absorbed, transported and utilised during a given physical activity. It is normally expressed relative to bodyweight (militres of oxygen per kilogram bodyweight [ml/kg/min]). Untrained individuals may have VO2max figures in the region of 25-40ml/kg/min whereas elite endurance athletes often have substantially higher VO2max’s in the range of 60-85ml/kg/min. Since VO2max is expressed relative to bodyweight any increase in bodyweight will negatively affect VO2max values. Your VO2max is influenced by a number of factors including age, gender, genetics, physiology, body-type/body-composition, training status, and exercise type. VO2max is normally established during a laboratory based incremental exercise test in which the speed/workrate is increased until the oxygen uptake peaks or there is a levelling off (plateau) in the oxygen uptake. A number of field tests (Cooper test, Balke test, ratio between HRmax and HRrest) have been established to provide an estimate of your VO2max although the accuracy of these tests has been questioned and they tend to produce varied results. VO2max can be significantly increased in the untrained or moderately trained – with the greatest improvements occuring with high intensity interval training – although the level of increase appears to be affected by genetic factors. Significant increases in VO2max appear to be unlikely in well trained or elite athletes. A high VO2max appears to enhance recovery rates after exercise. VO2max is clearly an important determinant of endurance exercise performance which appears to benefit both race performance and the ability to recover after training. However, most research suggests that VO2max does not significantly change in elite or highly-trained athletes and therefore coaches should consider the extent to which they are using training specifically to target further improvements in VO2max. Whilst there appears to be a clear benefit to including training at intensities around VO2max intensities (e.g. ~95-105 %VO2max) it is not clear whether these are as useful for longer term development (over a period of several months or even years rather than weeks – most research has looked at the short term benefits of high intensity interval training) as lactate threshold or tempo training. From my own experience VO2max interval training has led to improved performance at intensities close to VO2max but has not always led to improved endurance race performance, particularly in events of >30mins duration, and I have observed better long term progression through lactate threshold training and sub-maximal intervals (~90-95%VO2max) especially when utilising short active recoveries (~20-25% of the effort time).